This week, we were proud to launch a new template-based WordPress site for L&S Automotive, in Enfield, CT. A family-owned business for almost 30 years, L&S is a trusted auto repair shop, specializing in (but not limited to) high-end vehicles of every type. Plus, they are just plain fun to work with! Check out their site to learn more. L&S made good use of our start-up special with custom header, a great way to get started online. Over time, the website will be able to grow with them, as they add content, blog, and add additional images. If you’d like to learn more about a start-up website for your own business, contact us today! I’ve started the Abundance Project because Abundance thinking is the #1 path to success, and though I experience abundance every day, I often have trouble actually believing in it. Sometimes the negative thoughts that surround us creep in, take over, and carry more weight than the positive ones, and we need to dig deep to stay positive. Even though we know this with our minds, the other noise is often too loud. It takes every ounce of willpower we have to do what we know deep down is good, successful, and even more – fun – and that is to think abundantly. 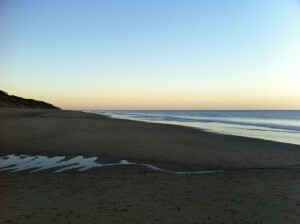 So, we must practice, and the monthly Abundance Project meeting, selfishly, is a big part of that for me. I’m also a big believer in sharing knowledge and bringing people together, and there is much we can accomplish in our own thinking by sharing that process. Gratitude Journal. Several of us had a routine, and it was interesting to see the differences. My routine is to write 4-5 things each morning that I am grateful for. That process always helps me to begin the day with a smile and the right attitude to attract Abundance. Others do a similar process before going to bed at night. I’m thinking, maybe both! Morning Routine. I’ve learned that how I start the day has a huge effect on how I think throughout the rest of it, and sticking to this simple order of events most often helps me stay on the Abundant thought wavelength. See How Do You Wake Up? for details. Avoid Negative Energy. Ever walk into a room and just feel in your gut that the energy is not good? Or, the opposite: Have you walked into a room and immediately felt a strong goodness? That’s real! Trust your instincts and go where the energy is good. The discussion was very powerful and uplifting, and we were reminded also that there are days we will not believe this stuff works. I’ve noticed while working on the Abundance Project that there are more and more of “us” out there who believe in, and have seen actual evidence of, Abundance Thinking at work. Your faith is strengthened by that collective power. Join us online! Even if you’re far away and can’t attend our monthly meeting, you’ll benefit from the online discussions at www.meetup.com/ctabundance. Online video is a big deal these days. Aside from the fact that YouTube is the #2 search engine behind Google, and the younger generation is spending lots of time on sites like Instagram (pictures & videos) and Vine (videos) – consumers just expect companies to have videos on their website. When someone recommends a restaurant, we want to check it out before we go (watch a video). If looking to hire a contractor, accountant, or consultant, we want to get to know that person a little (watch video) before we meet. If it’s widget or software that we need to buy, we may want to watch review, testimonial, and FAQ videos. I’m a big believer in having a real person from the company appear on camera (talking head video). It can go a long way to build credibility and trust, especially if it’s the business owner or founder. You can still have other images, graphics, animations, powerpoint, etc edited into the video to make things more interesting – but it’s nice having the personal touch. The biggest challenge with this making sure to come off as “real”. Even the most charismatic people seem to clam up in front of a camera – or they’re just not themselves. This happens mostly when they read from a script. Either their eyes are moving back and forth, or they just sound monotone and fake. Even if they use a teleprompter, it can come off badly if they’re not used to doing it. It’s NOT as easy as it looks! I hope I made the point well enough in the video above – whatever you do, don’t make a hostage video – where it looks like someone put hot lights on you and forced you to read something at gun point (which is precisely what many taping sessions probably feel like to someone who’s not used to doing it – but, the experiences our clients have are much different – we pride ourselves on making it easy and enjoyable). 1. Take the script one segment at a time, memorizing one line or section at a time, and looking right into the camera. Just deliver as much as you can remember. In editing, we can piece things together, using other images to cover up the cuts. The best part about this approach – since people tend to speak differently than how we write, what ultimately comes out with the approach will be better and more conversational – more real – than what would happen if the script was read out loud verbatim. 2. Don’t look at the camera at all. Talk to someone who’s off to the side – I call this interview style. You still don’t want to read off a script or telemprompter. Either have that person ask you questions that lead you to say what you want to say, or have them feed you one line or section at a time, just like I explained in solution #1. By far, the easiest way to handle this is to have a good interviewer stand next to the camera leading the conversation – talk for a while and then pull out the best parts in editing. One of the most important features of WordPress is the built-in security and self-protection against hackers and malware. While the truth remains that every website is vulnerable to hackers, because somehow malicious people seem to stay a step ahead of above-board programmers, WordPress provides the best security in the business, with many hundreds of people contributing to its backbone of software. WordPress Core: This is the large body of files and the database that “makes WordPress go.” Many, many volunteer developers write this code and keep it updated with better ideas and better security, and these updates are available regularly. WordPress Theme: These files determine the look and feel of your site. In a custom design, we create the theme from scratch using our client’s ideas, logo and graphics. In a template-based design, we use one of the many readily-available themes that have been pre-designed and built. WordPress Plugins: These are add-on software chunks that add functionality that is not built into the WordPress core. If you have a WordPress site, you likely are running 10 or more plugins for various tasks – Contact Form 7, All in One SEO, NextGen Gallery, Simple Shopping Cart, and Better WordPress Security are just a few that we include with our regular WordPress installation. Each plugin is written by independent developers, and they sometimes do and sometimes don’t keep their code updated. Keeping your website up-to-date and protected presents a challenge and a catch-22. In order to keep your site the most safe, it is recommended that you update your WordPress core files and plugins regularly, keeping your site running with the most current security patches. However, the challenge comes in compatibility. If I update the core today, will my theme’s code work with the core’s new code? Will the plugins I’m using get updated by their respective developers to work with the new core? Sometimes plugins that we know and love become “abandoned” by their developers and eventually stop working as the rest of WordPress moves on. A good analogy might be your car: Think of the WordPress core as the car itself, the theme is the car’s paint job, and the plugins are replaceable things like the tires, brakes, alternator, etc. If you buy a new car, your old tires, brakes, and even paint job may or may not work, even if you get the same exact car model a year later. If you put a 2013 Ford alternator into a 2014 Ford, it either may work fine, may not work well, or not work at all. So, what do you do? We recommend that once a year (like going to the doctor), you have a professional go through your site, back up the files, and perform all of these updates for you. While WordPress is designed to be a DIY tool, there are times like this that a regular check-up is important. Most often, things go well, but occasionally a plugin replacement is needed. But, in the end, your site is updated and as safe as can be. You may elect to do this yourself, but please be sure to take a full back up of your WordPress site first, in case something goes wrong and you need it restored to the previous version. As always, we’re here to help! Contact us for advice on your specific site, and you can trust that we’ll steer you in the right direction. I bet I got your attention with just mentioning those two things, didn’t I? These two topics, Social Media and SEO (Search Engine Optimization), are the most loved and hated necessities of the small business… We know they work for us, they bring us more business, but how do we make it all work? How do we use these tools to bring in more business without breaking the bank or devoting all of our time to them? In my experience, there is a wide range between I Do It All Myself and I Hire Someone to Do All This among small business owners. 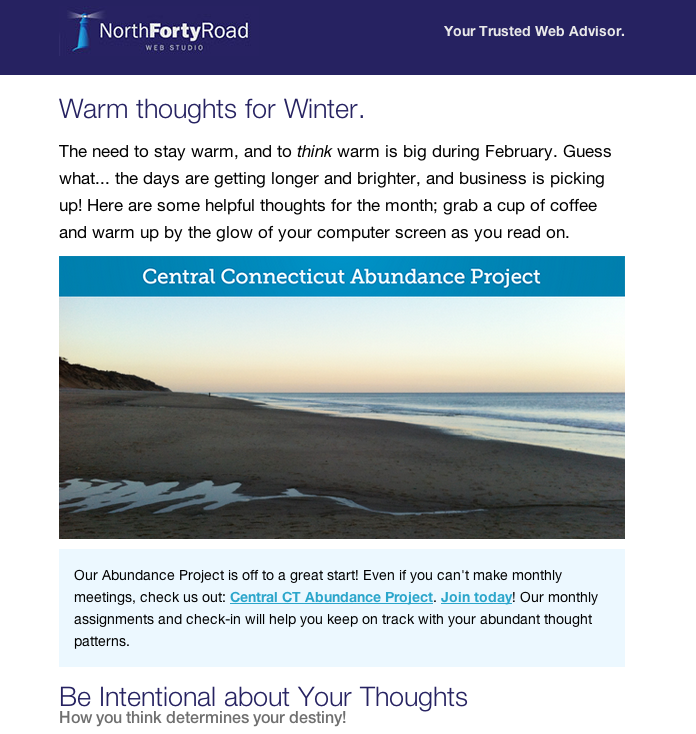 Even here at North Forty, we fall somewhere in the middle – performing some SEO and content tasks ourselves (for instance, this Connecticut Web Blog is primarily done by me, because I love writing and communication. It’s not for everyone. ), and other things are better left for trusted professionals who have far greater knowledge. The good news is that if you happen to be one of our clients, we can be sure you are working with someone you can trust, and will deliver results. Our newest colleague, Tim Dugan, turned me on to how SEO and Social Media are now one thing. That’s right, they are both necessary, and they all work in concert to drive more traffic to your site. Here is a cool infographic he created to easily describe the various social “engines” and how they communicate: www.webservicesct.com/blog/social-media-ct. Even more confused? Yeah, I know. We all need help with this stuff! However, that doesn’t make it any less important. Please be in touch with us today, and we’ll put together a plan to get your business recognized online in a way that you can trust. 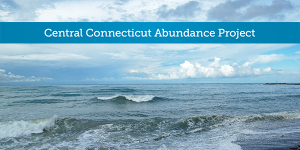 Last week, I hosted the first meeting of the Central Connecticut Abundance Project. A time of business networking and learning, this group’s main purpose is to advance the cause of abundant thought as a critical component to business (and life!) success. Even if you are far away, you can participate in this group via Meetup.com’s discussion and comments – we’ll be sharing monthly assignments that help us to focus more intentionally on abundance. Check us out, and join at www.meetup.com/ctabundance, and be part of our discussion! The first meeting was a very positive event, and I learned a lot from those who attended. I also left the meeting feeling motivated, excited, and renewed in my own successes. I’ve learned, perhaps a little slowly, that abundance thinking is the number one key to success in business. Yes, business ownership requires other things, such as hard work, connections, patience, talent, and of course just the right amount of “crazy”, but none of the things we “do” as business owners is as important as “how we think”. Belief in abundance and focus on the positive aspects of business life, and really our entire life-picture, is the most important ingredient. Beyond that, thinking abundantly simply makes it all more fun. Fun makes us happy, and happiness breeds more success. Abundance thinking does not come easily. We are all human, and thinking abundantly is not something that just happens, and continues to happen, just because we want it to. Human nature holds us back, negative messages we have received – from daily life, from upbringing, from all around us – creep in, and part of us listens to everything, and we have an EASIER time listening to the negative. This is where the “project” comes in. It takes daily practice, akin to learning a language or musical instrument, to think abundantly. And sometimes it takes complete willpower to shift the prevailing negative thinking to the positive. Even though you know with your head that this thought pattern is damaging, you can’t seem to help but continue down that path. I started this group because I believe wholeheartedly in Abundance thinking, in how it has the power to change my life, to change the lives of those around me, and to literally make dreams come true. I also started it because I’m on that journey. I’m no Tony Robbins or Jack Canfield, people who are very inspiring, and “get it” about abundance, but someone like you who is learning more every day, and can’t wait to work on it more. Like so many, I struggle with how to structure my work day to get it all done – let alone get it all done well or happily. Do you ever get an email from a client, let it sit in your inbox for several hours while trying to do something else, while internally obsessing over what that client meant, reading between the lines, and otherwise giving that message way more life than it deserves? That’s a day-killer right there! I even take it a step further sometimes: Send an email out to that difficult client, and then obsess over what the response might be… That one can go on for days! The latter issue is my own neurosis, and just plain ridiculous, but the former issue can be dealt with by using the advice of Ms. Davis: just answer the email now, and get it off your plate and off your mind. Rip off the band-aid, as they say! You’ll be glad you did. Email is such a huge part of what makes business tick, so make it productive in the way you think about it. Let it work for you, instead of against.